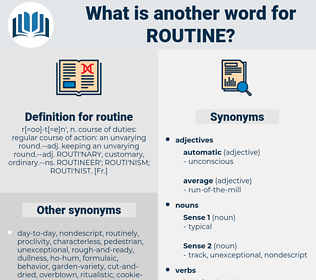 What is another word for routine? prevalent, systematized, traditional, day-today, widespread, mainstream, trivial. habitual, perfunctory, customary, mundane, frequent, business-as-usual, straightforward, systematic, banal, trite. rut, grind, habit, systematic, ritual. strange, eccentric, different, unusual, special, uncommon, irregular, original, breaking, abnormal, untraditional, variable, extraordinary, unconventional. Watch in and watch out, and nothing to disturb the even routine. The quiet village life, the dull routine of farming or mill life, early became interesting to me. raetam, ration, rotenone, ruthenium, retama, radiation, roadman, rotten, rewrite man, redeem, redden, rotation, radon, rhythm, retinene, ready money, retem, rodin, rhodium, radium, RETINA, red man, red wine, ruritanian, retain, radian, rhodymenia, radome, ruritania, ratan, rattan, retinue, red onion.